Volcanoes come in many shapes and sizes, ranging from common cinder cone volcanoes that build up from repeated eruptions and lava domes that pile up over volcanic vents to broad shield volcanoes and composite volcanoes. Though they differ in terms of structure and appearance, they all share two things. On the one hand, they are all awesome forces of nature that both terrify and inspire. On the other, all volcanic activity comes down to the same basic principle. In essence, all eruptions are the result of magma from beneath the Earth being pushed up to the surface where it erupts as lava, ash and rock. But what mechanisms drive this process? What is it exactly that makes molten rock rise from the Earth’s interior and explode onto the landscape? To understand how volcanoes erupt, one first needs to consider the structure of the Earth. At the very top is the lithosphere, the outermost layers of the Earth that consists of the upper mantle and crust. The crust makes up a tiny volume of the Earth, ranging from 10 km in thickness on the ocean floor to a maximum of 100 km in mountainous regions. It is cold and rigid, and composed primarily of silicate rock. Beneath the crust, the Earth’s mantle is divided into sections of varying thickness based on their seismology. These consist of the upper mantle, which extends from a depth of 7 – 35 km (4.3 to 21.7 mi)) to 410 km (250 mi); the transition zone, which ranges from 410–660 km (250–410 mi); the lower mantle, which ranges from 660–2,891 km (410–1,796 mi); and the core–mantle boundary, which is ~200 km (120 mi) thick on average. In the mantle region, conditions change drastically from the crust. Pressures increase considerably and temperatures can reach up to 1000 °C, which makes the rock viscous enough that it behaves like a liquid. In short, it experiences elastically on time scales of thousands of years or greater. This viscous, molten rock collects into vast chambers beneath the Earth’s crust. Since this magma is less dense than the surrounding rock, it ” floats” up to the surface, seeking out cracks and weaknesses in the mantle. When it finally reaches the surface, it explodes from the summit of a volcano. When it’s beneath the surface, the molten rock is called magma. When it reaches the surface, it erupts as lava, ash and volcanic rocks. With each eruption, rocks, lava and ash build up around the volcanic vent. The nature of the eruption depends on the viscosity of the magma. When the lava flows easily, it can travel far and create wide shield volcanoes. When the lava is very thick, it creates a more familiar cone volcano shape (aka. a cinder cone volcano). When the lava is extremely thick, it can build up in the volcano and explode (lava domes). Another mechanism that drives volcanism is the motion the crust undergoes. To break it down, the lithosphere is divided into several plates, which are constantly in motion atop the mantle. Sometimes the plates collide, pull apart, or slide alongside each other; resulting in convergent boundaries, divergent boundaries, and transform boundaries. This activity is what drives geological activity, which includes earthquakes and volcanoes. 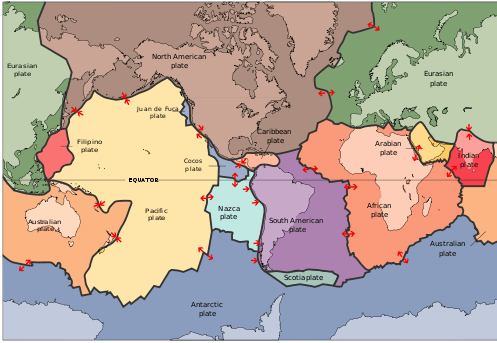 In the case of the former, subduction zones are often the result, where the heavier plate slips under the lighter plate – forming a deep trench. This subduction changes the dense mantle into buoyant magma, which rises through the crust to the Earth’s surface. Over millions of years, this rising magma creates a series of active volcanoes known as a volcanic arc. In short, volcanoes are driven by pressure and heat in the mantle, as well as tectonic activity that leads to volcanic eruptions and geological renewal. The prevalence of volcanic eruptions in certain regions of the world – such as the Pacific Ring of Fire – also has a profound impact on the local climate and geography. For example, such regions are generally mountainous, have rich soil, and periodically experience the formation of new landmasses. We have written many articles about volcanoes here at Universe Today. Here’s What are the Different Types of Volcanoes?, What are the Different Parts of a Volcano?, 10 Interesting Facts About Volcanoes?, What is the Pacific Ring of Fire?, Olympus Mons: The Largest Volcano in the Solar System.